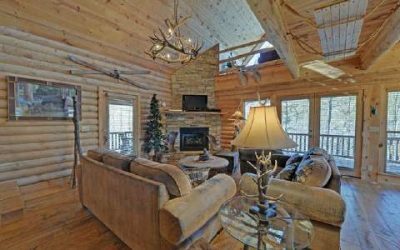 Log home lighting can be challenging, as log walls absorb light and lighting fixtures are difficult to add after the home is built. Of course the best time to add lighting fixtures to your log or timber home, is when it is being built. That’s because the wiring can be concealed in the walls. Later, installation will require an external channel to conceal the wires (and it will look rigged), or you may just have to let the wires be seen. Neither solution is very good. So, if you are in the planning stages of a new log or timber home, take special care to plan your lighting. Doing so will give you a well-thought out result, with years of pleasure in your well-lit home! 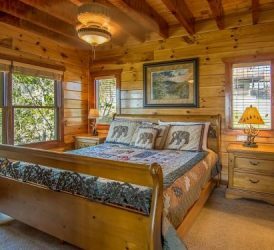 Is All Log Home Lighting the Same? The short answer to that is “no”. That’s because you will use your rooms differently. Work areas like the kitchen or bathroom will need bright lights so you can see when you are preparing meals or shaving in the bathroom. On the other hand, you might want to include softer lights in your bath, for times when you want to relax in the soaking tub. A pendant light like this one should be installed early in the building process. In the common area, you might prefer indirect lighting or softer lights. Trying to have a conversation with someone when a bright light is shining in your eyes, is annoying, at best. Reading areas will benefit from a lamp next to each chair. And bedrooms are usually fine with soft lighting from bedside lamps. Hallways need light, and overhead lights serve well to illuminate them. 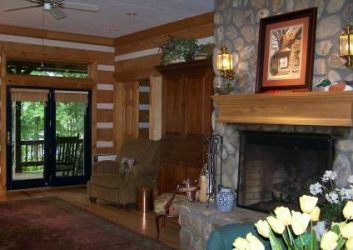 Lighting your log cabin or timber home will give it the cozy feeling that we all associate with log and timber homes. And there are a few tricks to doing it right. Wall Sconces – These are best installed when building your home. 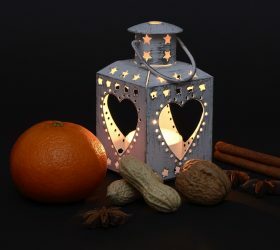 Use them to illuminate a dark area, to accent a painting or sculpture or in a hallway to provide lighting. They are also a nice accent on either side of a fireplace or in a dining area to provide soft accent lighting. These wall sconces make nice log home lighting on the fireplace for casual evenings with friends. They had to be installed during construction of the fireplace of this log home. Rustic Table Lamps – Table lamps can be added at any time. They provide task lighting for reading or you can illuminate a dark area, as long as you have a piece of furniture to set the lamp on. Table lamps are a way to express your home’s theme. 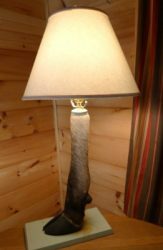 This moose leg lamp is a good example of rustic log home lighting. Chandeliers – There are so many cool chandeliers in many rustic themes. These should be installed when you build. However, choosing the right chandeliers will add so much character to your home! Do your homework, as a properly chosen chandelier will easily become a focal point and a conversation starter! Deer antler chandeliers are one of the most popular kinds of rustic chandelier seen in log cabins and timber frame homes. 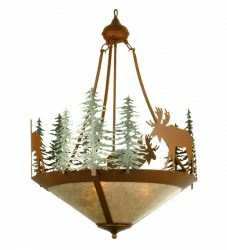 This rustic chandelier with a moose and trees, is an example of rustic log home lighting. You can purchase a this design chandelier here. Rustic Ceiling Fans – You can often find a rustic ceiling fan in Home Depot or Lowes. Ceiling fans are nice to include, as they add comfort to your home. Often, depending on where you live, you can open the windows and enjoy fresh air (instead of air conditioning), if you have ceiling fans. If you want a log cabin specialty ceiling fan, such as an antler ceiling fan, you’ll need to shop online or at a specialty cabin shop. 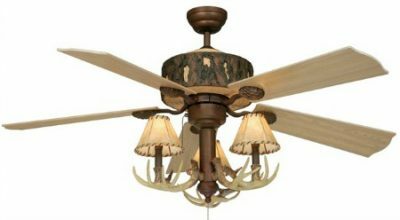 A rustic antler ceiling fan does double duty as a fan for hot summer days or to circulate heat and as log home lighting. This fan can be purchased here. to your log home lighting! Vanity Lights – These are used in bathrooms. They come in a number of cute themes, and you should use some thought in choosing these. You will spend a fair amount of time each day in your bathroom—and your guests will have lots of time to look around in the the guest bathroom! Rustic Ceiling Light Fixtures – This is the kind of built-in light that you see on ceilings in many homes. They are often round or square. You will be able to find ceiling lights with bears, trees, fish, etc. Usually this kind of light is not used in the great room or main living area—but you might use ceiling light fixtures in a bedroom, bathroom or hall. Ceiling lights can be used as log home lighting in hallways and also in bedrooms or kitchens. Ceiling fixtures with patterns and pictures – You may find rustic ceiling fixtures with patterns stamped into the metal of the fixture—or with pictures on the glass sections of the lights. This is a great way to carry out your moose, deer, pinecone or fish theme! This kind of rustic lighting adds the little details that make your home stand out from the crowd. Floor Lamps – You can add these at any time. And, in rustic settings, they often add interest as well as light. They come in all shapes and sizes and add character to your home! to log and timber homes. Lamp Pendants – Often used as accent lighting, lamp pendants are nice in a dark corner or over an island in the kitchen area. Lamp pendants are often used over an island to illuminate working and eating areas. 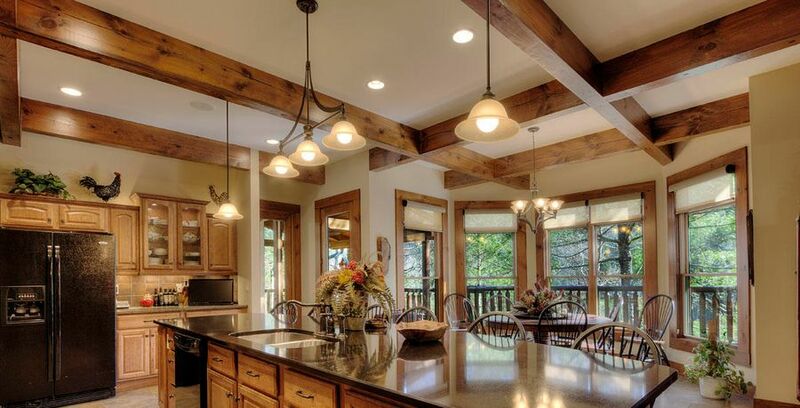 You can get cute light pendants that are decorative for log home lighting in the kitchen. Monorail Lighting – Not as decorative as some of the other lighting fixtures, monorail lighting is a great way to aim lights toward the decorative beams and trusses of your ceiling. Use this kind of lighting as little spotlights to highlight the impressive features of your home! Rustic Track Lighting – Simple design track lighting is often used to direct light in different directions and to highlight aspects of your home—like beautiful specialty beams on the ceiling. Rustic track lights can be aimed, and the direction of their lights can be changed easily. Track lights are often used as part of rustic lodge lighting. Recessed Lighting – Usually little round lights built into the ceiling, these lights can be used for lighting a work area in the kitchen or even as accent lighting–for lighting a favorite piece of art on the wall. Some of these lights use LED lighting and they provide a lot of light for their size! Rustic lighting with silhouettes – Some rustic cabin lighting fixtures have metal silhouettes. The silhouettes reflect a number of rustic décor themes—moose, fish, canoes, pine cones, horses, bears or deer. And the simplicity makes them a nice addition to a log or timber home. 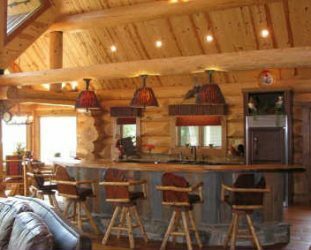 As you can see, you have quite a few choices when it comes to log home lighting. Some can be added at any time, but there are many that you will have to install when building your home. While it may be difficult to visualize what your rooms will look like when your home is finished, it is important that you choose your light fixtures and ceiling fans with lights—before you build your home. Because running electrical wires through a log or timber home can be complicated, at best, the most economical way to do it is when you are building your home—not later! The best time to choose cabin lighting is when you are planning to build a home. That way you can make sure there is adequate space for your chosen light fixtures and that the electrical wires to them, and their switches, can be put in place (and out of sight) while your home is under construction. 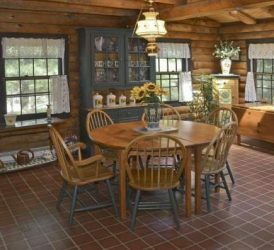 Keep your decorating theme in mind, and you’ll find that the log cabin lighting that you choose, will greatly enhance the comfort and beauty of your log or timber home!